Generally, we know that the flow of current in every electrical system will be from the higher potential area to lower potential area, to reimburse for the difference that lives in the system. In practical, the voltage at the transmitting end is superior to the voltage at the receiving end due to line losses, so the flow of current will be from the supply to the load. In the year 1989, Sir S.Z. Ferranti came up with a theory, namely astonishing theory. The main concept of this theory is all about “Medium Distance Transmission Line” or Long Distance Transmission Lines proposing that in case of no-load operation of the transmission system. The voltage at the receiving end frequently enhances beyond the transmitting end. This is the Ferranti Effect in power system. What is a Ferranti Effect? The Ferranti effect definition is, the voltage effect on the collecting end of the transmission line is higher than the transmitting end is called as “Ferranti Effect”. Generally, this sort of effect happens due to an open circuit, light load at the collecting end or charging-current of the transmission line. Here, charging current can be defined as, whenever an exchanging voltage is connected, the current will flows through the capacitor, and it is also called as “capacitive current”. When the voltage at the collecting end of the line is superior to the transmitting end, then the charging current rises in the line. Ferranti effect mainly occurs due to the charging current, and couples with the line capacitance. In addition, the following parameters must be noticed. Capacitance depends on composition and length of a line. In capacitance, cables have more capacitance than bare conductor per length. Whereas in line length, long lines have higher capacitance than short lines. Charging current turns into more important as load current decreases, and it Increases with the voltage of the system given the similar capacitive charge. As a result, the Ferranti effect happens only for long lightly loaded or open-circuited energized lines. In addition, the fact becomes clearer with higher applied voltage and underground cables. Let us think the Ferrenki Effect in extensive transmission line where OE-signifies the collecting end voltage, OH-signifies the flow of current in the capacitor at the collecting end. The FE-phasor signifies a decrease in a voltage across the resistance R. FG-signifies a decrease in a voltage across the (X) inductance. The OG-phasor signifies the transmitting end voltage in a no-load state. 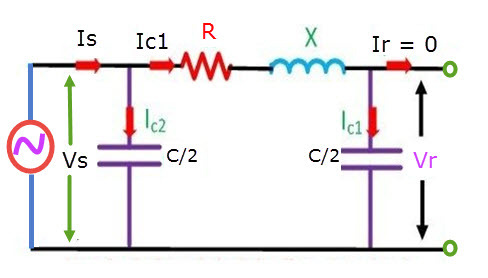 The nominal Pi model of the transmission line at no load condition circuit is shown below. In the following phasor graphical representation that OE is greater than OG (OE>OG). In other terms, the voltage at the receiving end is superior to the voltage at the transmitting end when the transmission line is at no load condition. Here the Ferranti effect phasor diagram is shown below. For the lines of overhead, 1/√LC = 3×108m/s (velocity of electromagnetic wave transmission on the broadcast lines). The above equation illustrates that (VS-Vr) is negative, that means Vr is greater than VS. This is also illustrated that this effect will also determine by the electrical period of the transmission lines and frequency. 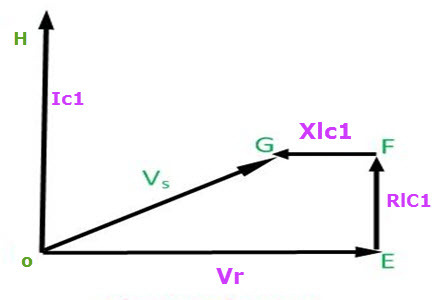 For an extensive transmission line, A is<1 and it reduces with the increase in the extent of the transmission line. Thus, the voltage at no load is greater than the voltage at the load (Vrnl > Vs). As the length of line rises in the voltage on the collecting end, then at no load acts as the main element. Electrical machines work on specific electrical energy. If the voltage is far above the ground at the consumer end their device get damaged, and the windings of the device also burn due to high electrical energy. Ferranti effect on extensive transmission lines at no-load status, then the voltage will increase at the collecting end. This can be restricted by keeping the shunt-reactors next to the collecting end of the transmission lines. This reactor allied between the lines along with neutral to give back the capacitive current as of transmission lines. As this outcome happens in lengthy transmission lines, these reactors pay off the transmission lines & thus the voltage is regulated within the set limits. In this article, the overvoltage can be established due to the Ferranti effect with the transmission line length. It occurs when the transmission line is energized, but there is a less load or the load is detached. The outcome is due to the voltage drop across the line inductance being in phase with the transmitting end voltages. Thus, the inductance is liable for generating this occurrence. This effect will be more marked the longer the line and the higher the voltage applied. From the facts of the Ferranti effect and by reimbursing this effect, the impermanent overvoltage in the transmission line can be decreased and thus the transmission line can be protected. Thus, this is all about the Ferranti effect in a transmission line, which includes what is a Ferranti effect, Ferranti effect calculation, etc. We trust that you have a superior comprehension of this idea. Moreover, any questions in regards to this idea, if it’s not too much trouble give your feedback by remarking in the remark section beneath. Here is a question for you, what are the disadvantages for Ferranti effect?